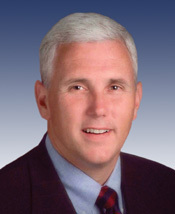 PENCE, Mike, a Representative from Indiana and a Vice President of the United States; born in Columbus, Bartholomew County, Ind., June 7, 1959; graduated from Hanover College, Hanover, Ind., 1981; J.D., Robert H. McKinney School of Law, Indiana University, Indianapolis, Ind., 1986; unsuccessful candidate for election to the United States House of Representatives in 1988 and 1990; elected as a Republican to the One Hundred Seventh and to the five succeeding Congresses (January 3, 2001-January 3, 2013); House Republican Conference Chair (One Hundred Eleventh Congress); was not a candidate for reelection to the One Hundredth Thirteenth Congress in 2012; Governor of Indiana, 2013-2017; elected Vice President of the United States on the Republican ticket headed by Donald Trump, and was inaugurated on January 20, 2017. Papers: 2001-2012, 23 cartons and approximately 70 GB of electronic records.. The congressional papers of former Congressman Mike Pence are closed until 10 years after receipt (December 5, 2022) or after death of donor, whichever is later.